Blue America Spirit Shot Glass - 30MM Shell Casing | BUDK.com - Knives & Swords At The Lowest Prices! Made from a genuine 30mm A-10 Warthog Gau-8 shell casing, the Blue America Spirit Shot Glass will put some bang in your bar! 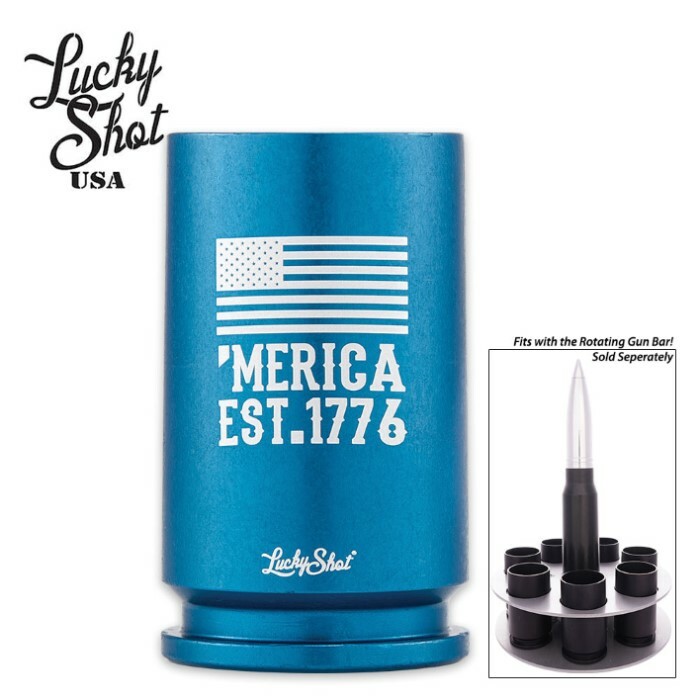 This sleek, looking shot glass features a vibrant blue color and an American Flag with “Merica Est. 1776” on it. Each shell casing has been thoroughly inspected, cleaned and then professionally anodized. The shot glass is 100% safe to drink from and contains no chemicals or toxins. This shot glass is not dishwasher safe but must be hand washed to preserve the vibrant color. Since it is made from a genuine once fired shell casing, it may contain minor blemishes or scratches consistent with its history.